I reset my phone but now I can’t sign in with my old Facebook account. I was on level 1569 and now I’ve lost all my progress!! Tired of the special pieces, fish and wrapped and all the others, going to other places on the board except where it’s needed. Not paying anymore to your games. Use to enjoy playing this game. Now you have made it hard to win power ups. Bring back the the quest and get rid of Mr. Toffee Fair. Every where you coming up with how to make money. Thinking of moving on to other game. This game is so fun! I love playing it. It’s much better than mini golf king. This game is awesome!!!! Twice I’ve play close to the expiration time and won. The problem is ...the gold bar bonus is NOT given before time expires. This is irritating. 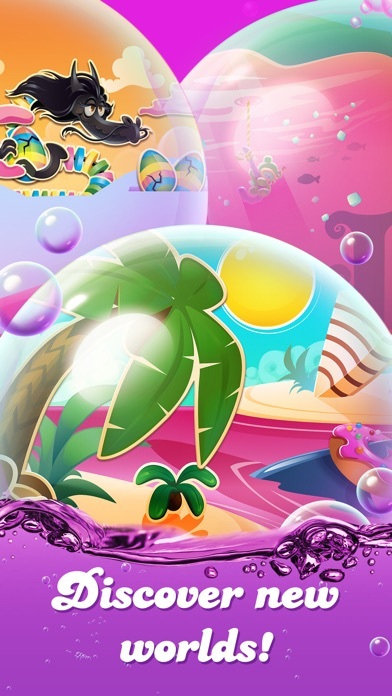 Candy crush soda is stuck yet again!!!!! I was very close to level 2000 and my app just had me accept new terms and when I accepted it brought me back to level 1!!! I’m extremely mad!!! I love this game and have been playing since the very beginning. I’ve seen many updates and seriously, why can’t we have a skip button?!?? Sometimes all of the hooplah at the end of the level takes longer than passing the level itself! Many other match 3 games have a skip button. Please add it to the next update! I like this game but lately when I log on the game will freeze. Sometimes I get my daily bonus but now it won't even load them. Screen shows the road and your level but you can't play. I have logged off and logged on but it doesn't work. I lose all my daily prize levels and start on day one or if I do get the prize I am locked out of the game till it's expired. Hate this but now I spent a small amount for some boosters and now I'm locked out again. Guess I'll have to quit playing again. Tried using the app support button and got sent to download site with no ability to get help. I down graded my rating. Used to be my fav. Every time I try to play no the game freezes and won’t load. Started to happen after they added the stupid race game to it.. 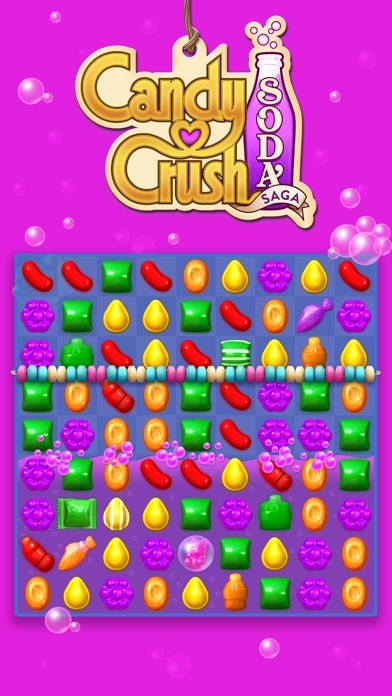 I love Candy crush but this version seemed a bit more dull and so do the graphics. I understand the jelly's "texures" as it may seem like that but this game isn't so hype as the og king apps and will not connect to Facebook. Another thing are the glitches. Got frustrated and so I deleted the app. I’m extremely upset and very close to being done once again playing this game. You took away our daily missions and replaced it with a bingo type game. You guys pick the players and I have been stuck on the same exact board for over a week because another player hasn’t finished there square. I can’t change players either and the ones I’m stuck with are NO help at all!! It’s almost impossible to finish a straight line! If I wanted to play a game where I have teammates I wouldn’t have started playing this game! I used to play this game all the time, multiple times a day and now I don’t even want to play it anymore. STOP changing things. Disappointed game player!!! This should be optional. I enjoy the game but I don’t like competing against other players. That’s not what the game used to be. Please add in the option to opt out of this! When you’re bored these games definitely keep you company! I’d like to know if there is some kind of regulator for apps. 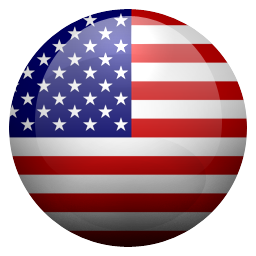 Recently, I sought help on YouTube for level 2166 on Soda Crush. This game gives only 20 moves. When I reviewed YouTube the number of moves indicated a year ago was 30. What happened? Why was there a reduction in offered moves? I tried several times to win this level without assistance, but it’s virtually impossible with only 20 moves. Maybe someone else is able to accomplish this task with 20 moves. I can’t. As it is, I had to use several power-ups to get past this level. I’d like to know if the number of moves was lowered in order to manipulate players into purchasing more power-ups? Happy to jane an opportunity to win gold bars without appending money. Now PLEASE add an “are you sure?” before you accidentally waste 10 bars on extra moves just because you had sloppy hands reaching to clear the end screen. Hice una actualización y no me recuperó los días que llevaba. Me borró todo!! All these new updates are frustrating. I don’t want to race people. And I definitely don’t want to collaborate with them to get prizes. And only getting to flip two tiles a day? Really? I haven’t been playing this as much because of this. There have been about 3x (not close in time) where the app has locked up on me. Ive even rebooted my ipad and nope. Game just sits there I cant do anything. The only thing that works is deleting and readding the app. i can get back to my original level but i lose all my boosters. What a bunch of BS. I have been a candy crush player for as long as I know, but all of the sudden today it took me from 2111 to 1823. I want to know the reason for this. Who’s idea was that???? It’s no more fun to play this game. Mr. Toffees fair???? I am done. Deleting for good this time. Update 4/8/2019- over the weekend they release bubblegum hill. I won a total of 5 times usually getting dethroned within the hour of unlimited lives I had. You know how even if you are on the throne for 1 second and then dethroned you get 1 gold bar. So the first 4 times I took the crown I didn’t get a single gold bar when I was dethroned even immediately and I didn’t care because I got 6 lollipop hammers. However, that all changed when I played one last time and I won the crown and I was on the throne for 16 minutes before I got the notification I was dethroned, I log back in and see I did not get a single gold bar. I feel ripped off. I’m not changing my star rating because King finally eliminated Mr. Toffee’s Fair and brought back daily quests, even better the daily quests I was working on when they took them away. I’m still disappointed though because I ran out of boosters over the Mr. Toffee’s Fair fiasco that I started using my gold bars to pass levels. So now I have none of those. Hopefully I can make it without the extra moves for now. 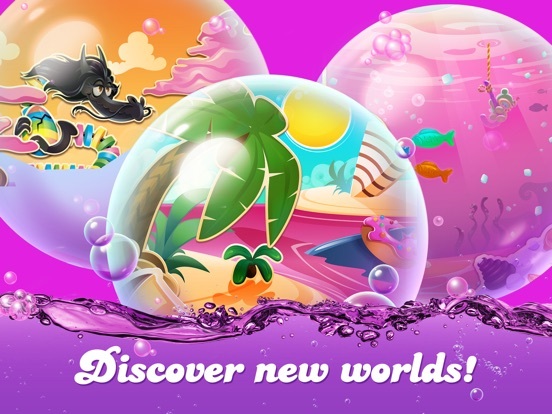 So I’ve been playing CC Soda since it was released because of the new fish combination of the candies made it more interesting than original Candy Crush. I actually took a break from it for a year and finally came back this year. The Gift boxes for advancing every 2 levels is a big help. I like the Bubblegum Hill because I can earn gold bars and lollipop hammers. I enjoyed the Daily Quests because the boosters helped me progress levels within the Episode Races so I can get first place for 5 gold bars. Also a big fan of the Rainbow Road boosters because once I get all 5 per level you can’t stop me and winning on my first try is so rewarding. The free Gumball Goodies every 48 hours are give or take sometimes its a 2 hour booster when I have zero lives. Right now I’m on level 1483, and I can’t win on my first try I waste all of my unlimited daily login hearts and even my regular hearts. The boosters with the daily log ins help somewhat but other than that I have no boosters. However, up until a few weeks ago, the game changed. An update happened where Daily Quests were removed. I enjoyed them to earn boosters. So I did my research and found out that King is in a testing phase for Mr. Toffee’s Fair. So not everyone received it. I jumped on an online forum to see what the deal was and find out that Mr. Toffee’s Fair is working within a team and I don’t know about you but any group project I’ve ever had in my life and I’m in graduate school I’ve dreaded. Working with complete strangers to gain 1 booster...it saddens me. I’ve read all of the complaints about the game and it’s been 3-4 weeks and King hasn’t addressed the issue. The moderator @XCarly in the forum stopped replying when the forum had 7 pages of replies. Now keep in mind I did list all of the free things CCSS has to offer but I would still like my daily quests back, as I do not like working with others but right now if not having my quests means I don’t have to work with others to gain boosters then so be it. I haven’t had the issue of my game resetting and losing progress. I do have my issues with the fish though, they never go where needed and the fish booster in the beginning literally does nothing not clear a space or a candy or anything. I would say that most of these hard or extra hard levels I could’ve passed with a gummy hand. I’m relying on using my lives for bubblegum hill every weekend even if I don’t gain more than 1 gold bar I still need the lollipop hammers. I’m hoping Mr. Toffee’s Fair since it’s still in testing will be unsuccessful and the game will revert back. That’s why I’m giving a Fair review 3 stars because I haven’t been inconvenienced much. It may be taking me whole days to pass one level (not even the hard or extra hard just basic levels) now but I’m sufficing. I used to love this game. Now it’s become a cash grab. Before, even when you couldn’t get past a level, you were working towards earning boosters that would aid you in moving ahead. Every so often you would win a gift box or a king of the hill challenge and enjoy some free play with unlimited booster time. So even the harder levels were not that frustrating. Now the system has changed: * the boosters are less powerful. And the game seems to “randomly” drop them in the least helpful place within the game making it pointless to buy them. You can start a level with two of each booster and still loose. * rather than earning free boosters by simply playing (which made it less frustrating to get stuck on a level for a long time), now you have to work with a “team” to complete a challenge “bingo”. Many squares involve using boosters, and you are limited to how many squares you can complete in a day. Winning gives you much less in terms of rewards than the personal challenges used to, and, as of yet, I haven’t had a teammate help complete any of the squares. * reward boxes and king of the hill games give you less rewards. * finally, the game constantly encourages you to buy additional moves to win a “race” against other players. Minuscule rewards if you win. I didn’t download the game to compete against other people or work as a team. I also don’t enjoy having to buy extra moves for every level. And what is the point of having boosters when they hardly impact gameplay. If the game doesn’t go back to what it was I’ll use up the rest of my boosters and move one to a different game. I love this game it’s my favorite.. but since they changed what you get in the presents (it use to be candy and unlimited lives or stuff) I just hate that now they changed it so you can’t get candy. And then they changed the quests and that was just stupid. Really?? I have to wait on other people to finish a quest and make a line out of it like bingo. I thought it be neat but in the end you only get one piece of useless candy. All they are doing is pushing for people to spend there money. Yes I know my grammar is horrible before people start pointing it out. This used to be my favorite game, but the removal of quests and the addition of Mr. Toffee’s fair has ruined the enjoyment for me. It is almost impossible to get some decent rewards without relying on an unknown partner who may or may not be playing and then if you win you might get an hour more of playing time but not the helps you might have earned before. The only good thing about this addition is that I know longer desire to play it everyday. It is a good way to break your addiction to playing such games. App will not allow me to sign in. Also, changed phones and lost all my boosters. Pretty hard to clear levels past 1300 without boosters. I get bored, because too many are too difficult!! I Have had this game downloaded twice to my iPhone. It is my favorite game of all time. But every time I get to 74 it freezes up. I am so frustrated and discouraged. Is there a fix for this or should I delete itAnd be done with it. Every update brings less and less joy to this game. Please change it back. No one likes this “team” tic tac toe thing. I will not spend another cent here until things go back to how they were. I’ve spent years and $$$$$$ on this game... what a waste. I am a long time fan of this game. When I first started playing boosters could be earned daily... like in original candy crush. Then that was taken away and you had tasks to accomplish to earn boosters. Now that is gone. All you get is free play time. At least give us a choice if we want to be awarded extra time or boosters. I'd take boosters! And award you five stars! I went to play this game again and could not get out of it. I had to shut down my phone. None of the screen gestures work and frankly, there is no excuse for this. Well, goodbye King. At long last you’ve created a version that just doesn’t work for me. The method of getting power ups has changed, costs have changed, levels are getting ridiculously hard and the challenge is just a scheme to get more money from the user (who wants to lose, eh). It is also frustrating when fish or power ups go to the most useless spot in the game. In some cases the user is placed in a position where power ups/moves need to be purchased to complete a level before old age catches up with user. I could go on, but you get the picture. For years I played this game for fun (over level 2,000), but it is now aggravating. By the way, is it supposed to make me feel better when the app informs me that100,000 people have purchased extras to complete a level? This just tells me that greedy King wants more of my wallet and made the level too difficult. NO MORE!!! This team prize competition is dumb. I’m tired of waiting on other people to get two lame prizes. Bring back the old prize system. I’d rather only depend on myself, plus you got way more prizes! What a horrible idea team playing is. You billed it better than incentives? Wow, what a stretch. Take away earning power ups again and say it 'better'? I'm done. To many difficult levels. Why so much Licorice??? Started to play 4/3/2019, realized all my progress was gone. Was up to level 1300 now on level 25! Yes was logged into Facebook but no help! Not happy! Es el mejor juego jamás realizado!!! Queen Jelly has taken the fun out. I’d prefer not to play against an annoying character but Queen Jelly is such a drag I’m over it. Can’t open nothing on game. It will open up but level won’t open to play. What happened to challenges to win boosters?! What happened to challenges to win boosters?! Since the last update there doesn’t seem to be any challenges to win boosters?! What gives, bring them back! A fun challenging game! I love it! 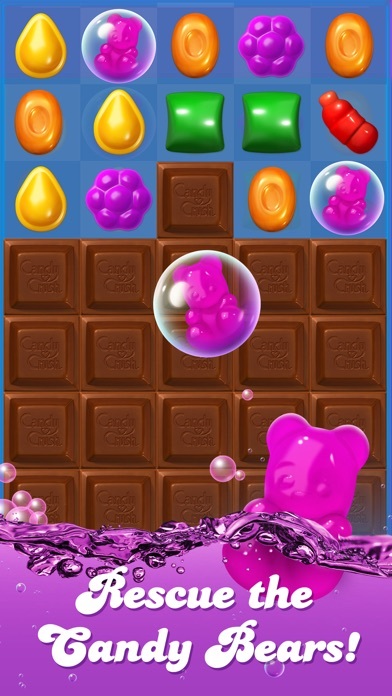 Best game by candy crush. Thanks for amazing game to keep me busy. You should be sued. Games are fixed. To pass certain levels you need to buy stuff. Some of these levels are too hard & the only way to pass it is to get extra help. You either have to buy extra help or take months to complete. I play games to relax not to be tormented by the developers 👎 looking for a new puzzle game. 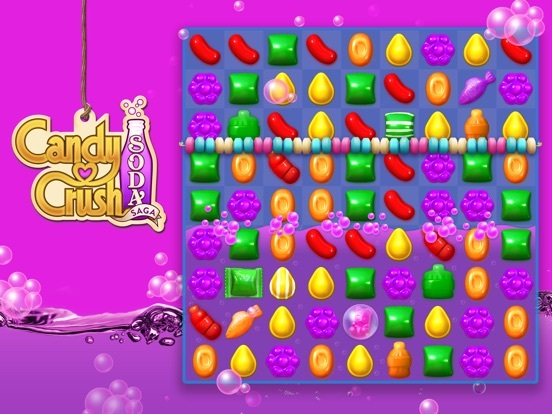 I quit candy crush several years ago for the same reason, soda crush was supposed to be easier & fun. I have the new team based challenges. Makes me realize how many people no longer play this game and I’m heading in the same direction. Why the need to manipulate players into buying lives when you deliberately make them stuck on a particular level,it’s meant to be fun and entertaining and used to milk players of cash! I've been playing both candy crush regular and candy crush soda for several years. I've finished 1300 levels on one and about 800 levels on the other. Very addictive, wastes lots of time. Was lots of fun but now for whatever reason it will not connect to the Kingdom or Facebook to get rewards or track progress. Also does not remember the last challenge I passed and now I have to go thru about 300 levels to get to the last one done and go on to the next unfinished one. I've uninstalled and reinstalled candy crush regular and soda along with Facebook, completely logged out of everything, still will not connect to the kingdom or Facebook. Have not done a factory reset of my iPad or cell phone, shouldn't need such drastic measures! Other games work fine and communicate with Facebook just fine. Now I only spend a few minutes per week, not much fun when none of the 'rewards' or bonuses work because the game is not able to connect or says I don't have an internet connection. I played this game for a very long time (as you can tell from the streak). I really enjoy it. However, after I managed to play it yesterday morning, I came back to find I was unconnected from Facebook. No problem, I was used to this and tried to reconnect. It got stuck for the rest of that day and this morning in an endless cycle of checking WiFi and “Failed to connect” messages. I couldn’t even get into the game because it kept repeating those messages and trying to connect even after I restarted my phone and closed the app completely. I thought it would fix overnight, but it didn’t. With the app in such an awful state, I did the only thing I could think to do and deleted it off my phone before redownloading it. Not only did this not fix the problem, it also completely erased my 93 day streak and has made me feel very opposed to even trying to get back into the game when it decides to glitch out and be the reason I lose what I’ve worked hard to get. It also got rid of my boosters. I would have rated this app well if you’d talked to me two days ago, but now I’m furious. Very fun and cleverly thought out. BUT...really wish there was a prize wheel too. Some levels seem impossible but the more you play that level, the easier it becomes - like it's all pre-arranged, which is kinda disheartening. Also, it would be cool if you ended a level with a Color Bomb or striped candy, that it would go into a "bank" of extras you could use later. Nothing worse than feeling that treat you just earned was for nothing! Would also appreciate Bubblegum Hill being offered more often and for a longer, more consistent period and not on a random basis. Many times I open the game and Bubblegum only has a couple of hours left, even though I've played within the 24 period that it implies it's been active but it didn't show up! I even exit out of the game to see if it's going to appear but it doesn't always. Overall, a fun, addictive game. Just know that it's a game of luck, not skill. Play on button should be taken away or moved!! I’ve been playing this game for a long time and continue to get frustrated that the stupid “play on” button is right where normal people hold their phones. There should be an “are you sure” box that pops up like when you press the quit button. I’ve lost too much gold by holding my phone in my hand when the game ends. I think it should be removed from the end screen and have it’s own box. I went to the website to complain about it, like many people already had done, and the only answer they got was “it’s your fault you need to move your finger if you know the box is there”. Well if it’s problem lots of people are having them they should fix it and not blame it on the gamer. Doesn’t make me want to continue playing because I worked so hard to earn those gold bars only to have most taken by a stupid click of a button when I was just trying to click on the screen. I love this game and play everyday, along with candy crush and cookie jam and sugar smash. I loved the graphics, but on the update I did yesterday, u put tiffys face o. The overview of levels completed and I can't even look at it. I try covering her face to find the levels that only have 2 stars because I play till all the levels are three stars. I use to be able to see each level in color and with the different symbols of the section like on octopus. Now it is just her face and I can't even see the levels I need to complete! I HATE IT! I want the update taken off!! I want the colorful graphics with the different scenes and characters!!!! I can't look at all the levels I've completed with that tiffy face it makes me not want to play anymore. I'm going to have to cover her face with s paper to try to find my place!!! Please change it back!!! Then u will be 5 stars. I was getting frustrated by this game so I took a break for about 6 months. Thought I would see if any updates improved my opinion. NOPE! 1. The rewards are great, but I miss the challenge of beating the levels using my own skill. I've beaten levels with 2 moves because of all the boost rewards when I'm sure I could've beaten them on my own. It would be helpful to have the option to pause or bank reward boosts and choose when to use them. 2. I do not like the timed boost rewards. I'd rather have the option to bank them instead of being forced to play them or lose them. Sometimes I just want to play for a few minutes, but then I lose my reward. That's not a reward, that's holding players hostage. 3. Some "easy" levels are beyond difficult. 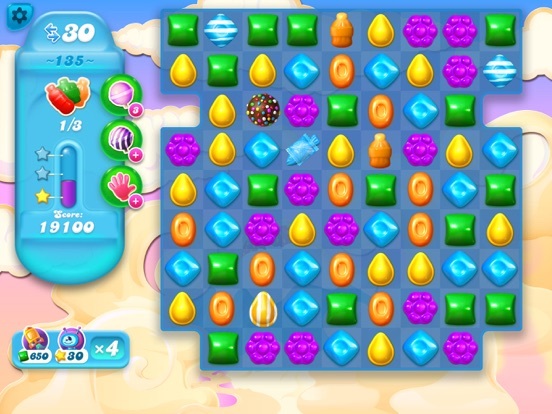 For example level 1027 is labeled easy, however, beating this level is nearly impossible. I had the rainbow boosts plus an extra candy bomb AND and extra color changing boost and didn't beat it. I lost every boost I had and am still on that level. 4. GIVE THE CHOICE OF WHERE THE FISH GO! I have lost games because the fish don't go where I needed them to go. They often detonate other boosts that I am setting up for a power move. 5. 10 gold bars for an additional 5 moves? These are difficult and costly to obtain. Give me the option of using an additional life for more moves instead. 6. Lose the puzzle piece aspect of the game. It's pointless and annoying. 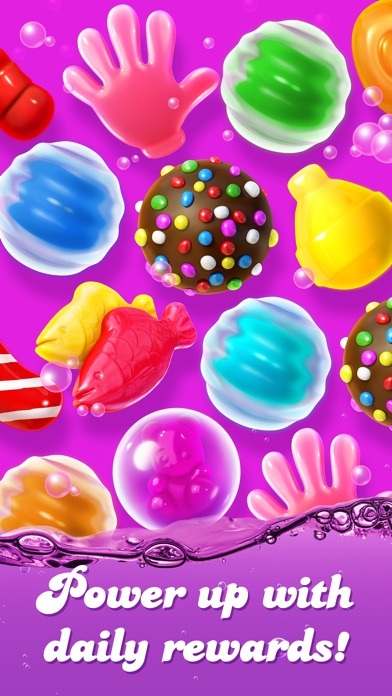 The candy crush games are not actually games. In real games, there is a potential for winning, by using the materials available in a strategic way. 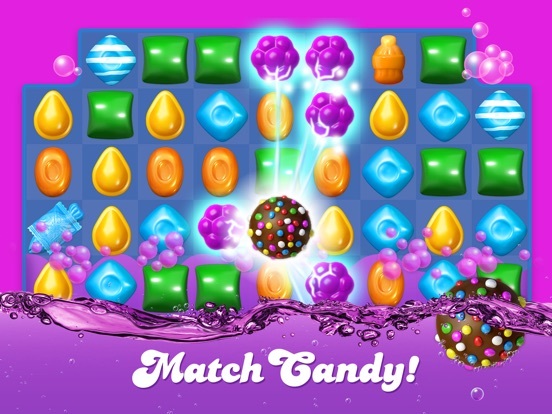 Candy crush is rather a programmed experience, in which the app controls whether you will have the materials you need to win or not. There is nothing random about your playing experience. You can be very strategic, and the app will not give you the opportunity to pass a level until you have played a certain number of games—then, suddenly, the game becomes extremely easy. Sound paranoid? Nah. They are in the business of frustrating you so that you will pay them money for extra doodads to help you win. But it’s such a dishonest set up. The app breaks the rules of its own game at times. Unfortunately, there are enough sparkly and clever aspects of this programmed experience that one is a dupe, for a while, until the grotesque dishonesty of the experience overwhelms the charm. Don’t give these people your money. They debase the very concept of a “game”. So this game is fun but it does little tiny things that I know developers put there just to mess with your game. Like when you need to spread the jelly, sometimes not all the spaces that should get jelly get them. Example: I match a fish in jelly so it’s suppose to go to an empty space (unless there’s ice or blocks) so it goes to an empty space and what do you know, the jelly doesn’t spread there. Then I find myself saying multiple times while I play “that’s not the move I made”. Maybe it’s human error, that’s what I thought until just now before I wrote this review. I had a special move, bomb with a color bomb, I wanted to make sure there were no mistakes I carefully place my finger on the bomb and swiped my finger towards the color bomb to the right, and what do you know? The bomb matched with the green piece under it and not the color bomb!! Please, fix this. I can’t be the only one who experiences this and I can’t be the only one who is complaining!!!!! Love this game..but FIX the Facebook mess!! It's great to have another King creation to pass the time while I wait for the others to recharge. At this point I had given 5 stars. ****But After months of smooth sailing yesterday the game kept taking me to Facebook. I'm not into Facebook, just wanted to relax and play the game but it kept randomly redirecting me, mid game after game before game. It just annoyed me so much. After searching for help and being frustrated so, I uninstalled the game at level 90. Then later I installed again now I'm on level 25. I hate Facebook and whatever caused this problem. Fix it! Please, enough already with Facebook. I'm losing lives and this fun game is becoming a huge headache!! I am seriously upset about this issue. Not digging the new 3 moves/7 bars thing. THIS IS RIDICULOUS! At the beginning I thought maybe it was a bug or something but now I see that it is not. So I stopped playing the game for couple of months when I came back I miraculously passed 100 levels in matter of one day. Then game suddenly became super difficult, I thought so at the beginning. But then I noticed that there are some glitches. 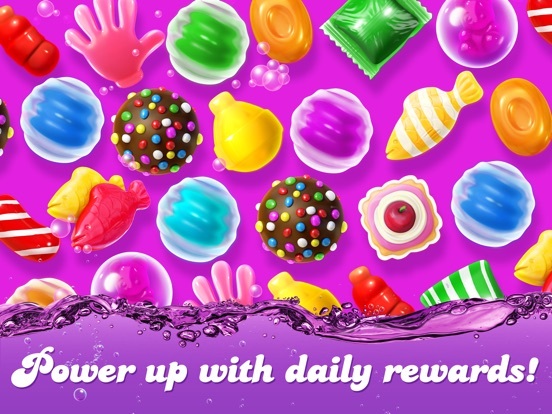 Such fr example as I match 5 candies and in stead of the colorful bomb I get stripped candy plus 1 regular candy. But this morning I have noticed that EVERY SINGLE LEVEL has had such glitch. Just now I matched 6 candies and I got a stripped one. The game simply at some point if you play a lot forces you to use extra powers so you have to buy them. As I said if it was an example repeating the same it could be a glitch but simply if I’m too close to end the level sometimes like this always happens. I hav screenshots that show that I could pass over 20 lvls at first time now I barely do one star. Time for couple of months break again I guess. Why did you stop offering boosters at the beginning of the game? You offer a free spin wheel on your other Candy Crush game but on Soda Saga, you offer 30 minutes or 2 hours of free play which I have never received! Please remove your newest ad that asks if we are sure we want to exit the game! If I press exit, restart, try again, or stop then I mean just that and do not need to be questioned about my choice! When we accumulate coins in our Piggy Bank why are we then charged a price to use the coins that we EARNED? Also, the Piggy Bank cannot be accessed until 50 coins are accumulated and you charge an unreasonable price of $1.99 for the coins yet they are only worth 5 moves! What is the BIG DEAL about earning coins and paying $1.99 when you charge the same amount for 5 moves already? Can someone explain this to me because it does not make sense to me!!! Like I said, Earned Coins in the Piggy Bank should equal FREE MOVES! I enjoy this game in general. It’s fun and challenging at higher levels. 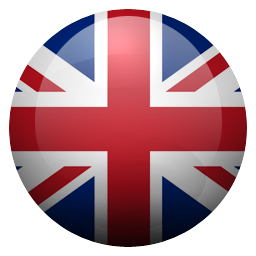 I think the app could be improved with a couple of changes. When you win unlimited lives by passing a level, it would be nice if you could accept it at a time when you have the time to really take advantage of it. Too many times I pass a level, earn the reward and then lose it because I don’t have opportunity to play for that long at that moment. Maybe create a way to accept your reward within 24 hours...? Also, the app needs a “confirm” button to purchase more moves with your gold bars. I have accidentally bumped the button to add more moves when I have had NO intention of doing so. A button to confirm purchase would prevent these accidental purchases. I enjoyed the game for several hours. Once I reached the point where it takes many several attempts to beat a level I gave up. I’ve been stuck on the same level for two days now and can’t advance. The algorithm decides if you win or not. Most games I can figure out the algorithm and exploit it. Not here. You can easily be stuck on the same level for days. I also advanced far enough to the point where you have to pay to play or wait like three days before it unlocks a couple levels for you. I found as you advance through the game it gets less rewarding and takes twice as long to beat. The ads get a little pushy. I accidentally purchased a couple of unwilling items. I refuted the charge and decided to not keep my credit card attached to my iTunes account. For years, I would have given Soda Saga 4-5 stars. I played when it first came out but eventually, moved on to other games. Last winter I got bored, and re-discovered my love of Soda & Jelly Sagas. HOWEVER, since about two months ago, I literally cannot play Soda. If I'm able to get past the initial screen without a crash. then it crashes when I click on the level I'm playing. Rarely am I able to get the level loaded, and on those rare occasions it generally crashes during the game ... losing a life and whatever booster(s) I may have chosen. My love has faded like upholstery in a sunny window. Most days I don't even try anymore. When I do try ... crash, crash, crash, frustration and anger. (N.B. I have re-set my iPad Mini 100 times which used to help for a short while but now makes absolutely no difference). So Soda Crush goes back onto the ash heap of discarded games. "With every heartbeat I still think of you, and remember our faded love"
I really like this game but am not happy that when my old phone died and I switched to a new one I lost all of the boosters I have earned and saved. The crappy thing is the response that the game keeps it on your device HOWEVER that makes NO SENSE because my candy crush transferred everything over but not on soda! So why does one do it and not the other. I will probably stop playing because when your that high up in levels the boosters you worked for come in handy and now I have none so I’m not going to pay or play one level forever because they choose not to give you your boosters back. That is bad service and a bad design flaw that they can and know how to fix but choose not too. Make your customer happy let us keep our boosters don’t punish us for getting new phones. Up to level 948. Enjoy the game, not the best at it, BUT the game has been updated so the levels are so hard one can only win with extra moves. Fish used to go where they would benefit. Now they go idiotic spaces of no benefit. Had one candy that needed to explode to get 4th bear above string to win level. Spent $6.99 to buy 50 extra bricks and boosters. Went through those again needed one candy to break. Fish never went to that one candy. Spent $5.99 to break my bank for extra moves fish would not break that one candy. Got 3 extra moves for 7 bricks. Fish wouldn’t go to that candy. Used 16 bricks for 5 extra moves and booster. Used 39 bricks for 5 extra moves and booster finally after jelly candy merged with fish to make about 30 fish that one candy exploded. Didn’t have to spend but wanted to see how rigged the game has become. Yep! Riggged to make money over and above skill and enjoyment. Got the last $ that I will spend! Don’t expect any response from contacting support. There was a “connectivity” issue with all King games. Supposedly it was fixed almost immediately. It was not. Several hours later they announced all games were back up. The 3 Candy Crush games were still unable to connect- the solution “Delete the app and reinstall it but be advised you’ll lose all boosters”. That’s not a solution! Many of those boosters were earned over the past 2 years but many were bought and paid for. I’m reporting all my purchases from the last 90 days as unfulfilled via Apple and Google bc I’ve yet to receive any reply from King when I requested an ingame credit for 2 purchases made within hours on one and minutes on the other of the apps crashing. Lesson learned! This is the third (and last) time there’s been issues like this. I won’t give King another penny! I can still remember when This game began as a soft launch in limited countries in 2014. That’s how excited I was for this game because I loved the original Candy Crush Saga. The graphics in this game are so colorful and I love the new characters. The New Soda dynamic adds a unique touch to the franchise. The new Coloring Candy is also pretty cool. The best part about Soda Saga is that it’s not too difficult. 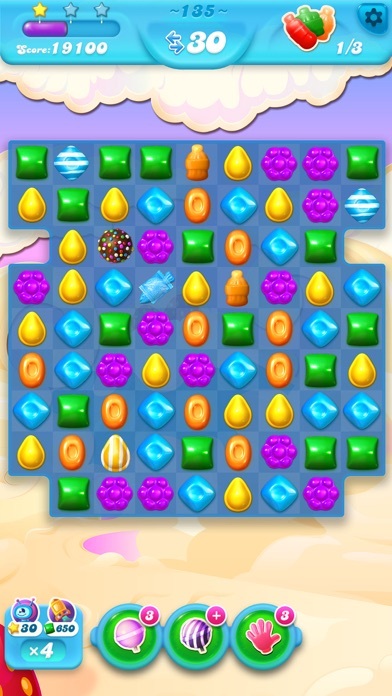 When I played the original Candy Crush, I came across some very difficult levels /land it was frustrating. 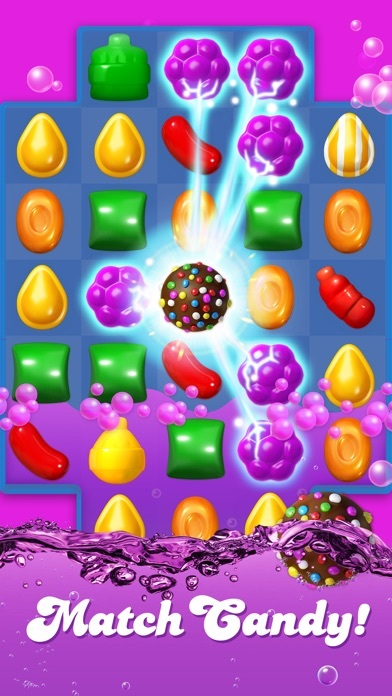 I played the newer Candy Crush Jelly Saga and I found it to be a boring game. There’s no reason for it’s existence. But Candy Crush Soda Saga is just right. I say I am going to stop when I reach 1000 levels, and now I am on my way to 3000. I am not on facebook and I cannot figure out how to let you know, other than this, that level 2318 has a glitch. I have used 26 extra gold bars after having cleared all the chocolate because it said I have one left. It does not appear anywhere after using those as well?? Please try to fix this by the next bug fixes. I do not want to waste anymore bars. Please note, this is the first glitch I have noticed in all of this time. I also love the bubblegum hill addition. It lets me restore pink lollipops and is a great series of varied games! What happened to winning items? I've been playing this game for a long time. I have reached 100 consecutive days and then the game updated and booted my score. So I did it again and got over 200 consecutive days. In that time, I watched as the game makers kept getting cheaper and cheaper. Instead of winning items for playing each day, we just get 30 minutes unlimited of lives or an item. While those are useful, it's not something that all of us players find useful. Why can't we still get items? You were alternating prizes but then went full 'cheap'. I save up items for travel (by car or plane) when I binge play. With no items slowly coming in, it's lost a lot of the fun it used to have. Plus, jelly saga still gives out items...for now. Please bring back items that we can save and accumulate. I used to love this game but not anymore. The daily bonuses stink. You don’t get anything to keep or build up to play the harder levels. It’s 2 hrs of this or that and if you don’t have that kind of time to play you’re screwed. The mini games like fishing and bubblegum hill were a nice diversion when you couldn’t get past a level and gave you a chance to win gold or boosters. They’re now gone! Don’t even get me started on that piggy bank, one of your reviewers was right and we built up all that gold under the premise we would win all the goodies and imagine my surprise when I had to PAY $5.99 to open it?!? Needless to say mine is still full and will stay that way. I used to spend a good bit of money because the game was fun and there were incentives to beat these levels. Not anymore. There are a lot of other games out there so I’m done with candy crush. I love love love this game! An idea came to me when I made a mistake! I had two fishes next to each other and under the orange fish was a chocolate color bomb! So of course I wanted the color bomb and orange fish to join and turn every orange candy into an orange fish. BUT instead my mind didn’t work and I joined the two fish which was stupid because I didn’t gain a lot of points and didn't breaking the honey! And at that moment i had a cool idea! There should be an UNDUE button. But of course it can’t be free. 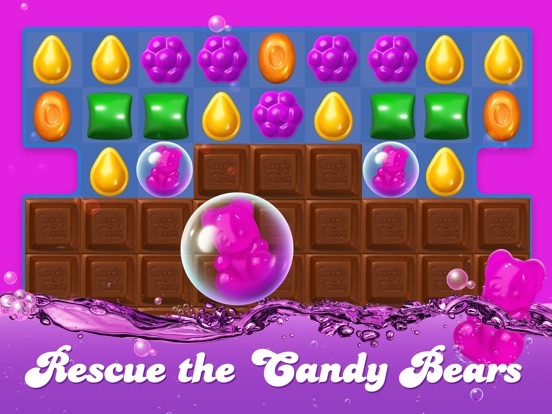 You have to cash in chocolate or it can be a free gift from the gum-ball machine! Or like a little gift is like 5 undos OR UNLIMITED UNDOES FOR AN HOUR!!! it’s genius! Hope someone runs with it! I loved playing this game until you started increasing the cost of extra moves! I never minded paying a dollar or even two when I had only one spot left to cover and could do it in one move or two but now the price has gone up to $3.99! Come on folks, we "senior" citizens, especially those on limited budgets, can't always afford to spend that much money all the time! We love playing these game as the help our brains keep active and bring joy into our lives each day especially when we aren't able to get out as often as we used to. Please make it affordable for us too! I have a problem when I spend my own money on this app and you take away everything I have purchased with my money also , built up from my game play. I had over 200 or more gold bars 20 plus candies every one of the candies and several were way over that ! I am over level 1000 and you had a glitch On your part so all my game candies and bars and level on the daily rewards all gone !! I wrote to you with no response!! That’s stealing and I have a serious problem with that fix what you took or I may get a lot of attention being the FIRST PERSON TO SUE !!! It may seem petty to people with millions of dollars but my money is my money and I don’t like it that people feel that they can take it away from me and laugh in my face when I write you and explain the issue!!! When you don’t have enough turns to continue play, and you don’t complete a level, it won’t let you out of the game unless you make a purchase. In other words, you’re stuck. You can’t X out, you can’t do anything. It just keeps putting you to the screen where you have to make a purchase to continue playing. Even if you have lives to plays four more games, it won’t let you out of even your first game unless you make a purchase. It may not happen at the beginning, but it happens sooner or later. I deleted the app and started over again, hoping it wouldn’t “crash” again, but it did. Then on my last purchase of $1.99, just do I could get put the game, I was totally stuck and it really did crash, and so I had to delete the app once again. I love playing candy crush, all versions! But lately I’ll pass a level and when I log back in the it takes me straight back to the level I just passed like I didn’t complete it. And it’s so aggravating when I’ve been on a level for a week and finally pass it and then it starts me right back over and I’m stuck on it again! I’d rather not even play if this is how the game is going to continue to be. First time I over looked it. Second time I wanted to delete the app and this time I’m going to! To bad too because I’ve spent a lot of money on this game as well as time. Please fix this! You will loose a lot of players if it continues to happen. I have been playing candy crush going into my third year... at this point I have to consider a different game... two years ago I made it to 289 consecutive days logging in... the app remained stuck for four hours so I re installed the app. I did go back to the level I earned but lost consecutive day log in.... thinking it was one time. I started the count over. This past December when I made it up to 319 days logging in it kicked me out the game and when I went back to play it started the consecutive days logging in back to day one... I started playing on my tablet and as of today I go to day 279 consecutive days logging... so December 19 will be 365 days logging in. My interest is no longer there because I have no faith in the game. An anyone tell me what happened if you log in 365 days consecutively? Very disappointed. Great time waster especially when you infinite lives...! However, once I reached level 298, it seems the game gets stuck in a.... loop? Sometimes it’ll take me back (four sections to move the bears through) to a spot that has no bears and I have no choice but to lose a life and end the game, or I get the bears above the candy string and it only reads one of them. In which case I STILL end up losing a life because I can keep playing, but the game won’t advance me through the next two stages like it sometimes does... Such a disappointment and frankly, a little frustrating since I’m not on a super high level (work out bugs much?). Anyways, I will re-evaluate my rating once this bug is fixed. This game is the coolest little puzzle game I’ve encountered. Love the whole design of the game. The animations, the colors, the boosters, and the soundtrack. One of the many reasons why I love this game is the soundtrack. I know none of you have probably put attention to any of the soundtrack in detail, but I recommend that you should. The violins, the piano, the flute, etc. Even the boosters have there own little sound affect. Like the striped candy, when activated it has violins playing 32th notes. The fact that the London Symphony played the soundtrack for a game like this one says a lot about the quality of this game. This game is so awesome I play it all the time and some times I will fall asleep playing it because I’ve been playing forever it is so cool and the fact that you get to save gummy bears is adorable this game is sensational think about all the cool power ups you can get and mixing them is funny because they twirl and there is tons of sparks it looks very cool this game is a time consumer and it helps me ignore my annoying sister who is always on my nerves this game is so awesome that there is nothing it can’t do and I can keep it in my pocket all day so it is ready to play when ever I want I absolutely LOVE this game. I didn’t mind spending money on gold bars when you were offering rewards that actually meant something. Now almost every bonus is time related. Which are often useless because real life interrupts game play and when you come back the bonus is gone. I have really enjoyed playing this game but for some of us we often need those bonuses to push through to the next level. Like I said before I didn’t mind paying for bars for extra lives and other things when I was given freebies in return. Now it’s just not as fun anymore. I definitely don’t recommend this game like I once did. Oh well. Can anyone recommend something to replace this game?????? TayRab & 2a3c3d5c got it! we should not have to buy gold bars we should be able to earn them. And the hints are just unnecessary and a little annoying. I want to play the game myself using my own skills. Not being shown which move should be next… Oh, and for your information, the hint moves aren't always good. So let me play the game myself. And let us earn more things like gold bars you are charging too much. Specifically considering the fact that we have to deal with freezing and crashing still. Please please... I love these games & I want to play them...... so please fix these issues. thank U; thank U; thank U. In the past I loved this game. Now it’s all about getting you to spend lots of money. Game is set up to use your hard earned power ups right away. Gone are the challenges to get some freebies. Now we have useless stuff like earn a crown, complete board on first try for a gold pin which gives you nothing. An the best is when you lose a figure shows up saying “psst.. 650,987 people used extra moves” to get you to spend more money. While I understand free games need to make revenue, lately King has gotten ridiculous about it. Almost desperate. Also the glitches where game won’t load so you lose your playing. I didn’t mind a couple of bucks here and there, but the way game is going now, it’ll be a cold day in hell before I dump any money into it. Would rather watch grass grow. My request is that there should either be a skip option when you win a level, like tapping the screen to bypass, or just take out the whole extra movies candies popping option. When you give us a limited timeline like 30 minutes unlimited lives or such it’s REALLY annoying to have to wait for those to pass, that’s sucking up my time. Also, sometimes when you play and it’s on a limited screen it will shuffle the candy and not find any moves then cancel it. Why should we lose a life because the computer couldn’t shuffle the candies?? 7 gold bars for only 3 extra moves is a rip off and beyond greedy! If you need more than 3 moves, which 95% of the time you do, you have to pay another 16 gold bars! You are going to lose players because of your greed! The gum ball machine is a rip off too! I splurged 39 gold bars for the gold machine and received 3 candy bombs! Totally unfair! I've been playing Candy Crush Soda since it's release. I'm currently in the 2000 levels. The majority of levels have become impossible to pass without using boosters or spending gold bars. Licorice on nearly every level is annoying and frustrating. The levels to gain soda bottles are ridiculous - they don't come out when they should. King has designed this game to spend a lot of money if you want to pass a level. I'm extremely disappointed. The game is not fun and now extremely frustrating. They have fixed the game for you to fail. The latest update is awful... asking me 3 times if I want to hit/end game? It is extremely annoying! I know you're just trying to take up more time so it's less time for us to use our boosters. You've took this game from enjoyment to stress and frustration. I am not the type of person to write reviews on apps or anything but since I’ve been addicted on this game for a while now and there’s something bothering me, I thought the developers should know. So you know when you receive random gifts such as a coloring candy for 1h you have to claim them right? -(I am not talking about the Gumball Goodies because these are claimable)- Well I can’t! I’d launch the app and get these gifts but I can never claim them and this is so frustrating. The game freezes and once i remove it from my open apps on my Iphone 7 and launch the game again, the gift is gone. Please fix this. If it weren’t for this problem I’d give the game 5 stars. Why oh WHY do you force us to buy gold bars earned through play? That is NOT fair at all. I refuse to buy them. My piggy bank has been full forever, and will stay that way until you change that feature. I’ve read another review about not being able to use unlimited lives in one session. I’ve brought this to your attention before, as well. Who has the ability to sit for 6 hours straight and play this game? That is ridiculous and unreasonable. All these updates you make...surely you can improve our experience by allowing a pause feature! I’ve played for years. I had many boosters built up from purchases, checking in daily, and competitions. I got a new phone, restored from the cloud, and had nothing. I was sent 60 gold bars after contacting King. No big deal. I’ll just build them back up. Except now, the daily check in doesn’t give you actual boosters, but the use of a booster for a limited time. The little gold bar piggy bank is so cute and such a great idea - except even after earning enough bars that he’s full, I still have to pay $5.99 to get the bars that I earned? You’ve got to be kidding. Sorry not sorry, King. You’ve cheapened this game and yourselves in ways that I never thought possible. I’m offloading and not deleting in the hopes that you will realize what you’ve done and fix your mistake. I have been playing this game for a long time time now. Although I really, really do enjoy it (the o my game I play) I do have some suggestions 😁 When someone is stuck on a level for a ridiculous amount of time, why doesn’t the tooth fairy arrive to help anymore? Also, I LOVE the daily bonuses!! May I suggest even better bonuses for people who are playing often to keep them motivated to continue playing? I’m not saying to make everything easy but almost like loyalty prizes based on what they could currently use to help them? Please keep coming up with more incentives!!! PS, does anyone ever win the jack pot?!?! What is the point of these things? Please remove or give the option to not have them or pause them. Also, add an option where you can direct where the fish go. Many times they end up going to a block that was already popped or doesn't need it. The game is great for waiting for appts or inbetween engagements. I love it for that. 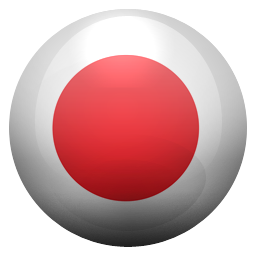 But there are some things that are more annoying nuisances than extra game features. It would also be helpful to choose when unlimited boosts and times are used. One may not have a solid 30 mins -2 hours to play something.